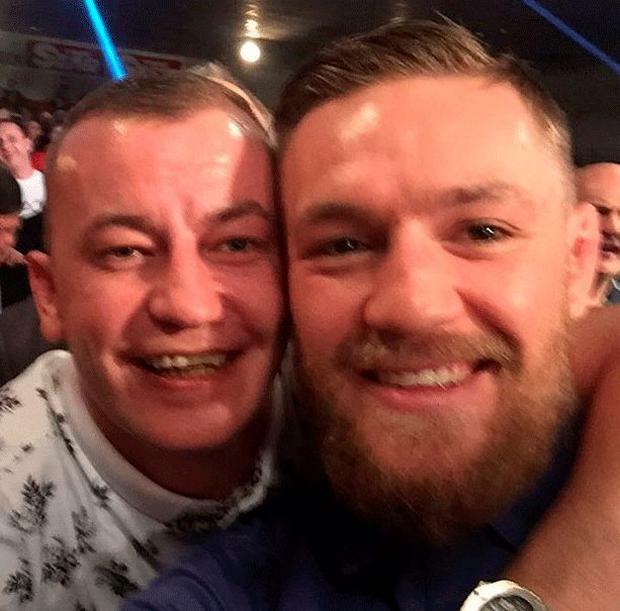 THESE pictures show UFC champion Conor McGregor and slain gangster David Byrne sharing a selfie at a boxing event. McGregor and Byrne – who was shot dead at the Regency Hotel – both trained at Crumlin Boxing Club, but one of its coaches has emphasised that they only had a “club relationship”. Byrne and his mob are said to have travelled to Las Vegas to watch the fighter, nicknamed The Notorious, last December for his title victory over Jose Aldo. However, club coach Philip Sutcliffe insists the photo was just a harmless selfie. “They were in the boxing club together and they would have had a club relationship and then they went different ways and David would have went supporting Conor and watching him do his stuff,” Mr Sutcliffe told the Herald. Byrne also posed for pictures with Daniel and Christy Kinahan Jnr, along with cousin ‘Fat’ Freddie Thompson. The pictures were published yesterday in the Sunday World. They were taken at a boxing event last year at the National Stadium, where Jamie Kavanagh was fighting. Kavanagh was also part of Crumlin Boxing Club, which has produced a number of Irish stars over the years. Last April, McGregor attended the funeral of Kavanagh’s uncle, Paul, in Drimnagh. Both McGregor and Jamie Kavanagh have absolutely no involvement in organised crime. McGregor is said to be an “inspiration” and a “childhood friend” to Kavanagh, and the pair used to spar at the boxing club before the UFC champion moved solely to MMA at the age of 17. “I think his mindset in what he does both inside and outside the octagon is inspirational,” said Kavanagh. Mr Sutcliffe told the Herald that the inspiration went both ways between the pair in their early days. “Of course I remember them, I was the coach so there would have been good spars between the two of them. “You see where Jamie’s going, he was to fight for a European title and Conor has gone all the way in the UFC,” he said.